Help a data center become more environmentally friendly by incorporating an energy storage and management system that relies on renewable energy. An energy storage and management solution comprised of Nissan’s second life electrical vehicle batteries and Eaton’s complete range of data center products adapted for renewable energy storage management and battery storage. Products include Eaton’s xStorage buildings solution, 93PM UPS and IPM infrastructure monitoring software. 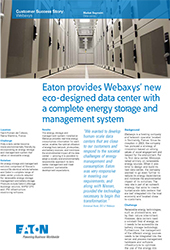 The energy storage and management system installed at Webaxys provides real-time energy consumption information for each server; enables the optimal utilization of energy from network, photovoltaic, and battery sources; and minimizes the environmental impact of the data center — proving it is possible to adopt a socially and environmentally responsible approach to data center management and meet customers’ sustainable development expectations. Webaxys is a hosting company and telecom operator located in Normandy, France. Since its inception in 2003, the company has pursued a strategy of innovation based on strong values of social engagement and respect for the environment. For its first data center, Webaxys relied entirely on renewable energy sources. When it was time to design and build its next data center, the company wanted to go even further to reduce its energy dependence and minimize the environmental impact of its activities. The new site is part of an outreach strategy that aims to create human-scale data centers that are well integrated into the local economy and located close to customers.